[26-Feb-16] As human activities continue to raise the levels of atmospheric and oceanic CO2, we require a clearer understanding of the responses of plankton to these increases and better ways to detect the global impacts of anthropogenic change on marine ecosystems. The Amazon River plume which contains the surface ocean's largest environmental gradient of pCO2 (~100 ppm and ~1300 µmol C kg-1), provides the perfect natural laboratory for making critical progress on these challenges. Our recent ship-based bio-optical measurements along the plume's gradient of salinity, CDOM, nutrients and pCO2, together with on-deck and laboratory - CO2 manipulation experiments, suggest that phytoplankton community structure and metabolic activity may be in large part controlled by DIC concentrations and to a lesser degree by dissolved inorganic phosphate and nitrate availability. 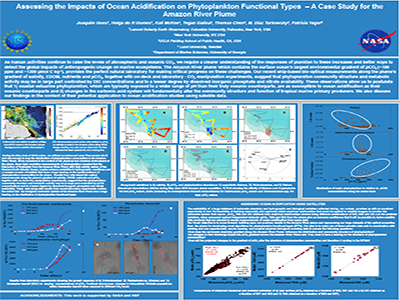 These observations allow us to postulate that 1) coastal-estuarine phytoplankton, which are typically exposed to a wider range of pH than their truly oceanic counterparts, are as susceptible to ocean acidification as their oceanic counterparts and 2) changes in the carbonic acid system will fundamentally alter the community structure and function of tropical marine primary producers. We also discuss our findings in the context of their potential application to ocean acidification studies using satellite data. Credit: Goes, J.I., Gomes, H.R., McKee, K., Galina, T., Chen, T.L., Turkowsky, M.D., and Yager, P.L..